Well I’m back (I Think), sorry I have not been around for the last few months, illness once again but I am hoping for a better year this year and hope that more and more readers will be drawn to this attempt at a sort of food blog. Yeah! Its 2012 the year of the London Olympics and I can say without doubt that here in London this year the food scene will be spectacular, just imagine all the visitors from around the world and all will be wanting to try all that foodies London has to offer and here in Pimlico we have some of the best there is. Here at Hide Tower it is all go for we are having all our windows replaced and the building itself is being given a good wash, yes we are have our windows replaced and Maureen and myself have chosen to have sliding windows/doors leading on to the balcony, yes its going to be noisy for a couple of months but by the time June is here we will have new windows and a new outlook from all our rooms. Once again I have changed things on this blog by including the sections; Vegetable/Fruit/Herb of the Week, Butchers Choice, and Catch of the Day, I wanted to let you know about different foods other than just a couple of recipes, I am going to try to keep to a seasonal format so please let me know what you think. At the beginning of the year, we are starting to crave for fruit other than apples and pears, its time to look out for the first early forced rhubarb. It’s still really the season for root vegetables and cabbages of all types and whilst we are waiting for the new season lamb we can still enjoy the last of the game, and while fish is plentiful, some boats have hit really bad weather so expect some fish prices to be a little high. The weather has been freezing or miserable, many of us are thinking they should be on a diet or a detox cure after the Christmas excesses, and no-one’s got any money so it must be time to make soup it’s easy, it’s quick, it’s nourishing and it’s cheap. Why spend money on expensive supermarket ready-prepared products when you can make a large panful yourself in less than 20 minutes with fresh vegetables bought on the market? Make enough to feed the family and have some left over for the freezer. British winter fruit and veg is not just for Christmas; feast on it especially after a sharp frost and don’t forget spring is not long in coming! Cheshire and Stilton cheeses are at their best this time of year, Kale, Spinach, Leeks, Swedes, Celeriac, Cabbage, Turnips are at their peak and just coming in are Winter cabbages, new carrots and the first of the early forced rhubarb. Cauliflowers from Cornwall make a tasty cauliflower cheese and the leeks from Lancashire are simply great for those soups and casseroles. Mussels, Crabs, Oysters and Lobsters are really delicious now and I find that British beef is very good value Maureen and I have just had Braised Beef and Onions made with a jolly good bit of shin. I can’t emphasise enough that the winter months are the time to enjoy British root vegetables and stores of local fruit and being harvested this month are leeks, green cabbages, parsnips, turnips, sprouts, celeriac, Jerusalem artichokes, shallots, mushrooms and forced rhubarb. Apples, Cranberries, Passion Fruit, Pears, Pineapple, Pomegranate, Clementine’s, Satsuma’s, and Tangerines, Almonds, Brazil Nuts, Chestnuts, Hazelnuts, Truffles (Black And White), and Walnuts. The humble carrot is best in January as are Bay Leaves, Brussels sprouts, Cabbage, Cauliflower, Celeriac, Curly Kale, Fennel, Leeks, Parsnips, Potatoes, Red Cabbage, Swede, and Turnips. Beef, Duck, Goose, Grouse, Guinea Fowl, Ham, Hare, Lamb, Partridge, Pheasant, Pork, Rabbit, Turkey, Venison, And Wood Pigeon. Speciality birds such as pheasant, partridge, and wild guinea fowl have become the fastest growing meats on sale in the UK as more Brits seek roast dinner alternatives. Tesco has seen demand soar by a staggering 100 per cent in the last six months. And Morrisons has joined the game and is stocking pheasant and partridge for the first time! ASDA has announced that its fresh Chosen by You sliced bread reaches the shelves in five hours from when its team of bakers begin mixing the dough, which is said to be 19 hours faster than other UK supermarkets. The British egg industry has launched an attack on the government for not doing enough to protect domestic producers against competition from illegal imported eggs. The uproar comes after the Food and Farming Minister said the UK would not impose a unilateral trade ban on shell eggs and liquid egg products from EU states that were not fully compliant with the EU-wide ban on ‘battery’ cages which comes into effect on 1 Jan 2012. Meanwhile, British Lion Eggs will be launching a ‘Think outside the Box’ campaign next year to encourage consumers to make more of eggs in main meals and buy packs of 12. The”British Lion Eggs Recipes” website will launch in January and feature a collection of recipes which together use up 12 eggs. After decades of being off the shelves, mutton is back in supermarkets! Waitrose is now selling Duchy Originals mutton chops, rib and shoulder joints. The Tesco online website now features dedicated ‘counters’ offering a selection of specialised products – from a cheese counter to a fishmonger to a butcher. See this link. 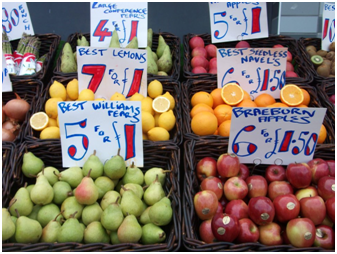 Although other retailers already offer fresh food online, Tesco is the first supermarket to do so on this scale. Whisky exports are booming! Scotch exports have increased to nearly £3bn in 9 months to September – a 23 percent rise since the same period last year! The Happy Egg Co owner has launched a new brand of eggs – Posh Birds. The range is available from Tesco and comprises duck and quail eggs. Aside from flagging up the eggs’ free range and free to fly credentials, Posh Birds packs also carry information about the breed of bird behind the eggs. Finally, it has been revealed that The Department of Work and Pensions only source 11 percent of their food from UK producers. And government standards as a whole regarding eggs, coffee, and milk in the public procurement sector are lower than those at McDonalds! So lots of work for Love British Food to do in 2012! Open every day except Sunday, the number of stalls in this ancient street market increases as the week moves forwards, the market offers a wide array of goods from home furnishings and gardening equipment, to fruit and veg, fresh meat, fish, shellfish and bread and cakes, the market is home to an array of events counting late night shopping, gourmet lunchtime offers, ‘Fashion Thursdays’. Managed by Westminster Artisans Ltd on behalf of Westminster Council it is set to be a community hub thanks to its lively diverse array of stalls with scrumptious international hot food the paella is superb, fresh food, chocolate, cheese, olive oil, bread, funky fashion, and lots more. Discover different stalls on different days. 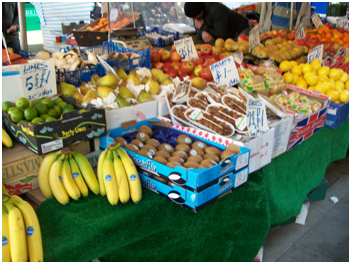 What a pleasure it is to see such fresh produce full of vibrant colours this week was no disappointment with what was on offer. There was Apples, Gala, English Russets, Braeburns and Bramleys, Artichokes, Beets, Broccoli, Cabbage, Cauliflower, Courgettes, English King Edward Potatoes, English Raspberries, Fennel, Field Mushrooms, Leeks, Mache (Lambs Lettuce), Parsnips, Purple Sprouting Broccoli, Radish, Watercress, and some fantastic pumpkins and squashes and you can plainly see that all of what was available was in first-rate condition. Brussels sprouts are a somewhat discordant food, while most people who claim they hate them they have probably been scarred by encounters with nasty overcooked sprouts in their influential years. When prepared with a little care, sprouts are a superbly pleasing vegetable with a delicious, fresh, green flavour and just the right amount of crunch. They can be served purely as a side vegetable maybe with some chopped chestnuts or a sprinkling of toasted sesame seeds, added to casseroles or sliced and stir-fried take a crack at cooking them with beef, spring onions and oyster sauce. Several sources trace sprouts back to ancient China whilst others claim they originated much later and were grown in the area around Brussels in the thirteenth century. It is known that they were not introduced to France and England until late in the eighteenth century. Today they are eaten in North America and Australia but remain a much more common sight on dining tables in Northern Europe, and Britain in particular. 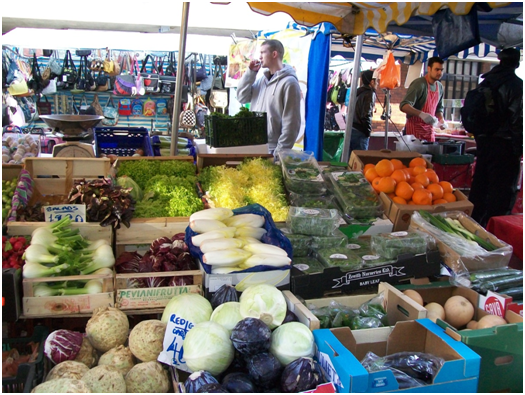 Brussels are a good source of vitamins A and C, iron, potassium and fibre. Look for firm, dense sprouts with green unwithered leaves the base end discolours quickly after harvesting and will often be slightly yellowish brown but should not be dark. Fresh sprouts have no odour or a delicate smell those sold on the stalk are likely to stay in better condition for longer choose small, evenly-sized sprouts for ease of cooking. Sprouts should be kept cool at all times and eaten before the leaves discolour or they develop a strong smell. Soak in lukewarm water for 10 minutes to draw out any insects in the leaves, then rinse under running water. Trim the ends but not right up to the base or the leaves will fall off during cooking. Remove any tired looking outer leaves some cooks recommend cutting crosses in the bases but this seems pointless. Simmer uncovered in an equal volume of salted water (alternatively steam or slice and stir-fry). Overcooked and undercooked sprouts are unpleasant so it’s important to check for doneness by inserting a knife tip into the stem end and removing the sprouts when they’re just tender (typically between 6 and 12 minutes when simmering; the repellent sulphurous cabbage smell is an indication of overcooking). Drain, return to the hot pan, and shake for a few seconds to remove excess water serve immediately (the flavour suffers if sprouts are kept warm for long). Try tossing hot cooked buttered sprouts with some finely chopped rosemary, crispy pancetta, and crumbled chestnuts. Season well with pepper. Brussels sprouts must be served immediately as the flavour suffers if kept warm for too long this is probably another reason for their bad press. As well as the customary cuts of meat on offer at Freeman’s they also had some exceptional beef we had a fantastic piece of brisket for pot-roast, also on show was some truly fine oxtail and at £6 a kilo you just can’t go wrong. We had some excellent pork loin chops at a much more attractive price and quality than is offered by the supermarkets. The domestic Guinea Fowl is still found in the wild where it forages in large flocks and is considered a fine game bird. It is mainly kept for food, as its eggs and meat are very good to eat. Sometimes called Pintade, Guinea Fowl is a family of birds originating from Africa, related to other game birds such as the pheasants, turkeys and partridges, and having a long history of domestication, mainly involving the Helmeted Guinea fowl? Here in the UK, they were usually known as “Gleanies” the young (called “keets”) are very small at birth and are kept in a brooder box inside the house until about six weeks of age, before being moved into a proper coop or enclosure. 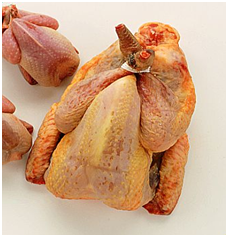 The cooked flesh of guinea fowl resembles chicken in texture, with a flavour somewhere between chicken and turkey. Guinea fowl makes a great alternative to chicken for a warming dinner on an autumn night. It has a lovely flavour that is slightly gamey but very subtle much less gamier than pheasant or grouse, it can be magnificent when cooked simply. Guinea fowl are an important food throughout much of Africa, south of the Sahara, and are found in every region of the world. France, Belgium, and Italy are amongst the largest producers in Europe. Guinea fowl are hardy birds that forage for food and so are often farmed in free range or semi wild facilities where they also perform a valuable pest control function. They have an acute awareness of predators and so are valued for their role as a ‘watchdog’, alerting farmers to any henhouse intrusions. It is reported that they have the ability to distinguish between farmers’ family members and strangers. 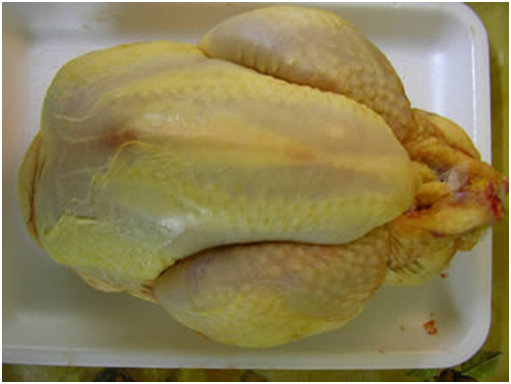 Guinea fowl meat is high in protein and low in cholesterol. It is a good source of vitamin B6, selenium, and niacin. Look for free-range guinea fowl, rather than intensively-reared birds. Many butchers sell free-range guinea fowl imported from France Guinea fowl eggs are excellent and worth buying if you see some. With giblets removed, a whole guinea fowl will keep in the fridge for 3 or 4 days. Guinea fowl is prepared in much the same way as chicken as it is generally a smaller bird, cooking methods that help retain moistness are recommended, pot roasting or casseroling. Barding or regular basting is advisable when roasting guinea fowl, legs, and wings are also excellent if marinated for a few hours before grilling. After a short Christmas break Jon is back and I think the people queuing up for his produce are getting longer and its no wonder as this week he had on offer some outstanding plump succulent Cornish Pollock on his stall, you had your choice of steaks and fillets. 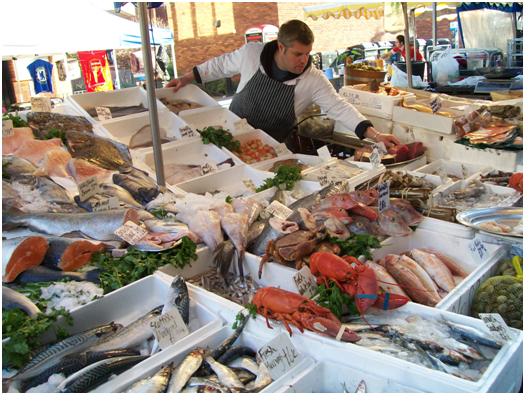 Developing from his Pimlico market stall, Jon set up his permanent fishmongers in Victoria Park Village in 2009. Filling a fish-shaped gap in the area’s rapidly increasing gourmet food scene, Jonathan Norris now inspires visits from further a field than this East London enclave. The low-hanging awning, chalkboard displays and ceramic tiles symbolize a stylish admiration of tradition. However, the produce at Jonathan Norris is far more forward-thinking than the simple cod and haddock you might find at the local fish and chip shop. Jon gets pleasure from urging us to try new produce and along with the sea bass and red mullet, their particularly fresh octopus, squid and sea urchins are all big news. Jon prides himself on the quality and sustainability of his fish, and deliveries come direct every day from the West Coast and Scotland. The store also stocks smoked fish, artisan sauces and cookery books. If it’s a fish supper you’re after then Jonathan Norris is the place to go, our supper on Saturday was mussels and the one we had from Jon were superbly fat and sweet with loads of flavour you just can’t go wrong with a big dish of fresh mussels. Oily fish like herring, mackerel, and salmon should have a light, fresh oil smell, like linseed oil. If they smell of rancid oil, don’t buy. However, February Is When Brill Is At Its Sweetest. 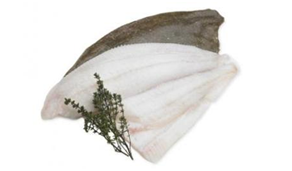 Brill is a high-quality pleasant tasting flatfish firmly linked with turbot, it is a fish found in waters from Iceland through to the Mediterranean and Black Sea, from Southern Norway, the Black Sea, and the Mediterranean, some of the most excellent are landed on British shores. 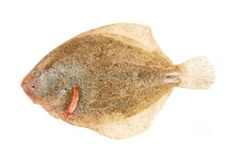 Brill has a smooth, dark brown skin with deep white speckling and as with other flatfish; its underside is a creamy-white. Fishermen have been providing brill to coastal European countries for 300 years or more records show that Brill was being sold in London’s Billingsgate Market in the early 1700’s. Comparable to Turbot in having succulent, slightly sweet flesh, it benefits from being easier to prepare and a little less costly than its more famous cousin. They feed on crustaceans and small fish living near the sea bed. Throughout late spring (spawning season), the fillets can be slight and moist so it is wise to stay away from them, the best time to buy brill is from June to February. A 1½ kilo fish will yield four fairly sized fillets, avoid small, immature fish (less than 1kilo), and choose thicker fish with bright, un-sunken eyes. Refrigerate as soon as possible after purchase and use within a day, or freeze for up to three months. Brill is typically gutted upon landing so if you buy it whole you just need to cook it whole or fillet and cook it, your fishmonger will fillet it for you if you ask nicely. 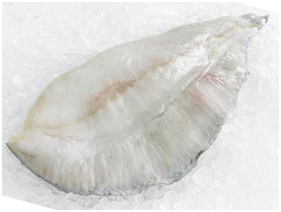 Fillets of Brill are usually sold skinned; pin bones are usually removed during filleting. To cook it whole, trim away the fins, head and blood-line, then grill, bake or roast. It is exceptionally good when cooked on the bone, by grilling, frying, or baking, like with any white fish, cook until the flesh is just opaque, firm to the touch, and easy to flake. The firmness and sweet taste of Brill make it a first-rate fish for pan-frying or grilling, serving with butter plain or flavoured a squeeze of lemon, capers, and subtle herbs. It can be poached and served cold with a mayonnaise or cook it similar to Turbot the flesh should be compact and slightly creamy, I find it superb steamed or poached served with a Beurre blanc, or steamed with clams, garlic, herbs and white wine. Alfredo’s Steamed Mussels, An Old Favourite From Alfredo’s Restaurant In Morecambe, Plump Fresh Mussels In A Tomato Broth, Flavoured With Garlic, Fennel And Wine. This was and still is one of our preferred ways to cook mussels, we first had it in this way in 1973 while on our honeymoon in Cala Millor, Mallorca When we went to live and work at The Willow Tree Restaurant in Bolton-le-Sands we found that Alfredo’s restaurant in Morecambe offered a similar dish and it is one of the most delicious ways to serve one of our much-loved shellfish, there are of course many more ways to cook this delectable offering of the seas bounty and we have included plenty of them in our collection of recipes. Crab and Shrimp Tian, For an impressive seafood starter try this sumptuous, crab and shrimp tian, ideally made with fresh-picked crab and the freshest of small pink shrimps. This recipe became a firm favourite in Palm Springs although the tiny shrimp we used was called shrimp meat and the crab meat we used came from Stone Crab Claws. Turbot with Shellfish, Very simple way to cook the best fish in the sea, with a few of his mates! This recipe is one I have yet to try it comes from Martyn Lewis who is a fishmonger and ex-chef from Brighton on MyDish and sounds like it could become a firm favourite. Well, I’m late again my apologies to one and all, I did think about not putting a blog up for May as it is so late however one or two have asked for a May blog so here it is. As the weather gets warmer in May, beautiful British produce can be found in abundance especially large, juicy spears of asparagus which are at their very best and cheap too, when I say asparagus I mean proper English asparagus, not that stuff from Peru or America, which is a bit wishy-washy not that I have anything against overseas asparagus but English is something special and I like the short period in which we can get it, and Jersey royals the new potatoes with attitude are mouth-watering sprinkled with sea salt flakes, black pepper and golden Jersey butter melted and poured over them. The English asparagus season officially starts on 1st May, but depending on the weather can start as early as mid-April the harvest lasts for approximately 6 weeks, until mid-June. Although asparagus was once only grown in certain areas of the United Kingdom, such as the Vale of Evesham, East Anglia, Kent, and London, it is now grown in most of the United Kingdom. It’s a great accompaniment to seasonal meats and fish, steam, grill or roast it, add it to tarts or blend it into soups no matter which way you cook it you are going to be in for a tasty treat. British asparagus, with its deep, intricate flavour, is considered by the British, at least to be the best in the world. 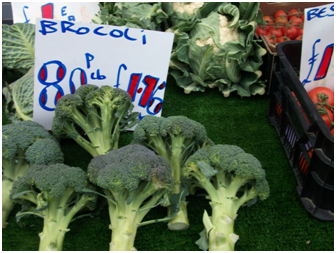 Its profound, lush flavour is ascribed in large part to Britain’s cool growing conditions. Traditionally only green asparagus has been grown here, but there are several types and varieties, in any case whether you’re buying tips thin ‘sprue’ asparagus or extra-large ‘jumbo’ spears, always choose stems that are firm and lush, rather than dry and wrinkly. Avoid any stems that are discoloured, scarred or turning slimy at the tips. If you’re using whole spears, then make sure the buds are tightly rolled. If you’re making soup, though, you could also use the cheaper, loose-tipped spears you sometimes find on market stalls. Regardless of what you may have read or heard, it’s not necessary to buy an asparagus steamer, nor to tie the asparagus into a bundle and cook it upright in a pan. For the best results, wash the stems thoroughly in a sink full of cold water. Then trim the stalks and, if the lower part of the stem seems tough when sliced and eaten raw, lightly peel the bottom third of the stem. Drop loose spears into a pan of boiling water and cook until just tender. The cooking time varies according to the thickness of the stems but ranges between 3 to 5 minutes; the Roman’s use to have a saying similar to “In a New York Minute” it was “Quick as Asparagus”. Once it’s cooked, drain, and pat dry on kitchen paper. If you’re serving it cold, you’ll get the best flavour if, rather than cooling under the cold tap, you spread the hot asparagus out to cool on some kitchen paper. Conventionally coordinated with hollandaise sauce, asparagus picked just a day or so ago (try your nearest farmers’ market) needs no messing with. Enjoy it with a mizzle of olive oil, a twist of black pepper and perhaps a few shavings of Parmesan cheese. Look for firm but tender stalks with good colour and closed tips. Smaller, thinner stalks are not necessarily tenderer; in fact thicker specimens are often better due to the smaller ratio of skin to volume. Once picked, asparagus rapidly loses flavour and tenderness, so it really is worth eating it on the day you buy it. If that isn’t possible, store asparagus in the fridge with a damp paper towel wrapped around the bottom of the stalks and you can get away with keeping it for a couple of days. Wash in cold water and remove the bottom ends of the stalks (with fresh asparagus they will snap off cleanly). Boil or steam quickly until just tender, around 4 to 7 minutes depending on thickness. For us (Maureen and meself) May is the start of our summer and as the days get longer and warmer we look forward to barbeques, picnics and lunches in the garden and the parks here in London, we always look forward to the new season asparagus delicious served cold with a nice tasty vinaigrette or a velvety, opulent Hollandaise sauce, we take pleasure in the delicate and unsophisticated texture of sea trout lightly poached in white wine with herbs or pan-fried with butter, lemon and capers we also look forward to the new season parsley, carrots, raspberries and the first of the cherries. I remember when we were at The Whitewell Hotel, The Willow Tree Restaurant and The Great Tree Hotel we always competed with other hotels and restaurants who would be the first to serve the first of British asparagus, strawberries and jersey royal potatoes, at Whitewell we almost always won and the same can be said for the Willow Tree but down in Devon it was always a real competition with Gidleigh Park and I am miserable to say they won more than we did, however it is still always nice to get the first of this seasons new fruit and veg with such magnificent flavours. May is unquestionably the time for new vegetables, and at this time there are so many that get going at the end of April that are either just coming into season or are in full swing it seems we are bursting at the seams with seasonal luxury this month so you must try to mix and match sumptuous asparagus, tender peas and spicy watercress to make mouth-watering salads and soups. All the usual suspects are available but it is the new season lamb you want to keep a lookout for and the outdoor reared pork, Welsh Black Beef is another that id beginning to show itself more and more. After particular beautiful Cornish weather in April which as always is excellent for catching and landing fish and seafood, May is and has been more of a challenge what with strong winds at the beginning of the month and now more winds this week netting and landing the catch has become a bit more difficult of a task for the boats and the same can be said for Scotland joyfully, what’s being landed is really superior produce. 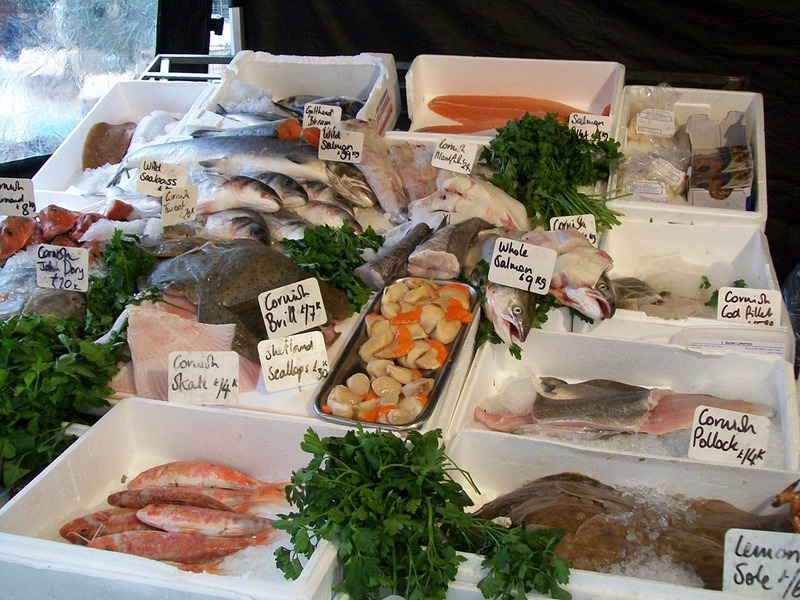 For all that wonderful fresh fish look for Sea bass, Turbot and Monkfish, Salmon, Sea Trout, River Trout are at their best, Dover sole and Lobster are coming back after their low season, and Cornish crab and other shellfish are simply superb. Line-Caught Mackerel is luscious, tasty, and plentiful right now, we are seeing reasonable sized fish, which makes for some lovely dishes whether you’re eating at home with your family or cooking for a few friends too. Mandatory rules for country of origin labelling are one step closer! The EU Committee for Environment, Public Health, and Food Safety has voted unanimously for country of origin labelling for all meat, poultry, dairy products, fresh fruit, and vegetables with a country of origin. Members also backed country of origin labelling for meat, poultry, and fish when used as an ingredient in processed foods. The decision will now be taken back to European Parliament in July where members must back a plenary vote. Tesco has started to import Black Angus beef from America, a direct competitor to Aberdeen Angus. 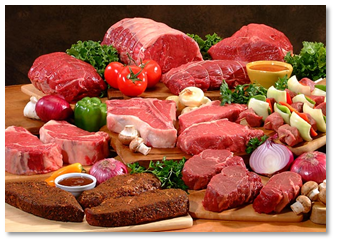 British farmers produce 64 per cent of the beef we eat. Most of the rest comes from Ireland, but also increasingly Brazil and now, for the first time in many years, the USA. British farmers fear this increased competition will undercut their beef on price and shoppers will move away from British! Don’t let this be the case – buy British today! Waitrose has become the first supermarket to commit to offering English only cherries for the key window of the UK season – five weeks at the height of the summer. They will begin selling cherries from May with imported produce from N. America, Turkey, and Spain. Imported cherries will then be phased out for the five week 100 per cent English season and then in August, as the English season draws to a close, it will be English topped up with imported fruit. Look forward to a bumper strawberry crop! The warm weather has brought crops out 2 weeks earlier than usual and is predicted to be the best harvest in 20 years. As a result the number of strawberries imported from countries like Spain has been reduced by 50 per cent. Tesco has pledged to sell predominately English strawberries from the month of May. Get your English aubergines now! The Yorkshire grown aubergines, supplied by English Village Salads Ltd, have come into season and will be available in supermarkets now until November. Tesco has met the local target it set itself back in 2006 this month. The supermarket has broken its £1bn barrier for sales of locally sourced products. Asda is exclusively stocking the branded Cornish Crystal potatoes this year. The Cornish new potatoes have already hit supermarket shelves, making them one of the earliest UK mainland potatoes currently being sold. Volume sales of English apples have risen by 6 per cent this year and could grow by a further 50 per cent on the back of recent strong support for the industry by the multiples. Harvey Nichols has announced it will be holding summer dining events to take urbanites out of the city and closer to traditionally produced foods. The Hand Picked by Harvey Nichols events include tours, culinary master-classes, communal lunches, and activities showcasing ethical fishing and traditional pig rearing. East of England Co-operative has launched a new ‘Sourced Locally’ brand in-store. 200 stores across Norfolk, Suffolk and Essex have been using shelf barkers to highlight food miles for some time but they are now broadening the marketing so all local foods are flagged up under the Sourced Locally brand. A new study by The People’s Trust for Endangered Species has found that nearly half of England’s traditional apple, pear, and cherry orchards have been abandoned or are being neglected. The loss severely threatens rare, historic varieties of fruit such as Sheep’s Snout and Slack my Girdle apples. Finally, planning applications are in place for at least six rabbit battery farms across the UK. Britain eats 3,000 tonnes of rabbit meat each year, virtually all of it imported, however many have concerns about the increased traffic and the animal welfare rights. Some state “They are moving away from battery farming in chickens, so it seems like a retrograde step”. 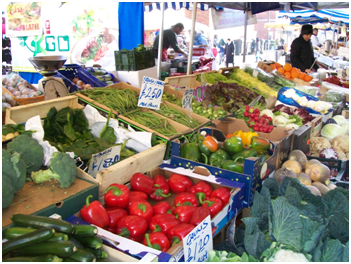 Vegetables: asparagus, aubergine, broad beans, broccoli, carrots, cauliflower, cucumber, jersey royal new potatoes, kohlrabi, lettuces and salad leaves, new potatoes, onions, peas, potatoes (main crop), radishes, rhubarb, rocket, samphire, spinach, spring onions, watercress and wild nettles. Fruit: cherries, elderflowers, raspberries, strawberries and tomatoes. Herbs: basil, chervil, chives, coriander, dill, elderflowers, mint, mushrooms (cultivated), mushrooms (wild), nasturtium, oregano, parsley (curly), parsley (flat-leaf), rosemary, sage, sorrel and tarragon. Meat: beef, chicken, lamb, pork, rabbit, turkey, and wood pigeon. 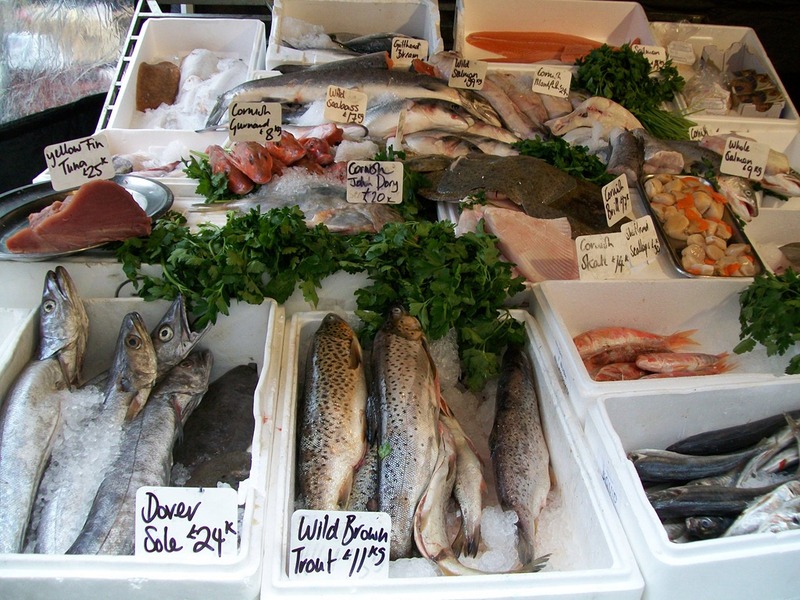 Fish: Cockles, Cod, Coley, Conger Eel, Crab, Herring, John Dory, Lemon Sole, Lobster, Mackerel, Plaice, Pollack, Prawns, Salmon, Sardines, sea trout, shrimp, whelks and whitebait. Open every day except Sunday, the number of stalls in this ancient street market increases as the week moves forwards, the market offers a wide array of goods from home furnishings and gardening equipment, to fruit and veg, fresh meat, fish, shellfish and bread and cakes, the market is home to an array of events counting late night shopping, gourmet lunchtime offers, ‘Fashion Thursdays’ and it will be hosting a brilliant Christmas market. Managed by Westminster Artisans Ltd on behalf of Westminster Council it is set to be a community hub thanks to its lively diverse array of stalls with scrumptious international hot food the paella is superb, fresh food, chocolate, cheese, olive oil, bread, funky fashion, and lots more. Discover different stalls on different days. 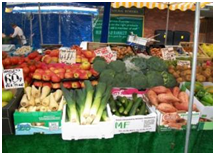 Sonny’s stall once again was a picture it is great to see such fresh produce full of lively colours, especially the Rhubarb it really looked vibrant and cooked up a treat when we made one of our favourite puddings so what else was on offer? Are displaying and ordering; The lamb is some of the best we have seen and his beef is well hung, the pork is outdoor reared and has a great taste with the fat to meat ratio spot on, we chose this week to have a small pork loin joint just for the two of us and at £4.25 for the joint we had a good 4 meals from it, The corn-fed chickens looked plump with a nice colour to them; this butcher is very proud of his offerings and has every right to be so. Jon’s display was as usual a stunning menu of all the best the sea can offer, his Wild Black Bream was simply the best we have seen in a long time and Brown Crab, Haddock, Lemon Sole, Langoustines, Sardines, Sea Bass, and Sea Trout along with Sea Urchins, live Lobster, Brill and Dover Soles and the line caught Mackerel made it very difficult for us to make a choice. We are not growing a lot this year because of the upcoming work on our windows, we have put in some mixed spicy salad and of course our much-loved Rocket (Arugula) and they are all coming along nicely, as well as our favourite herbs of Parsley, Sage, Mint, and Thyme. Put the salad ingredients into a large bowl and mix well, using another bowl mix the dipping sauce ingredients and put to one side. Whisk together the flour, paprika and salt with enough sparkling water to make a batter, dip the asparagus spears into the batter until well coated, shake of the excess and place in batches into the hot oil, deep fry for 3 to 4 minutes or until golden and crisp, remove from the oil and drain on kitchen paper. Place the warm tempura asparagus over a mound of the cucumber salad sprinkle with toasted sesame seeds and along with the dipping sauce serve and Enjoy! Have you ever made a recipe that smelled so good while it was cooking that you had to leave the kitchen because you wanted to try it before it was done? That’s what happens in our house when I make this delicious dish of lamb with fresh herbs, and it’s a very simple recipe to follow. Meanwhile, in a small blender whizz the bread, garlic leaves, rosemary, thyme and salt and pepper. Press the mixture onto each cutlet, and roast in the oven for 15 minutes. Serve with Jersey Royal potatoes or new potatoes and buttered primo cabbage and Enjoy! Maureen and myself well, we just like fish and seafood for its handiness, simplicity of cooking, taste and if it’s good for us well, that’s a bonus! Oil-rich fish such as Herring and Mackerel are rich in omega 3 fatty acids, which have been shown to have a lowering effect on blood fats; this decreases the chance of blood vessels clogging up with cholesterol. 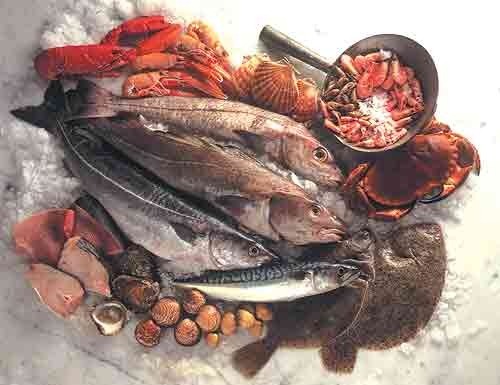 Oil-rich fish is also a good source of vitamins A and D.
Mussels have earned an eminent place in the culinary echelon. The Romans adored them and the French King Louis XVIII was a great enthusiast. Known to man for thousands of years, mussels are abundant in the Atlantic, though they are now often commercially cultivated. All along the coast, you’ll find mussels attached to small stones, seaweed and rocks; the larger ones are collected during low tide at the water’s edge. It is said that in 1235, a ship loaded with sheep was wrecked in Aiguillon Bay. An Irishman named Walton, the only one of three crewmen to survive, lowered a net stretched over four pilings into the silt to collect his food. He soon noticed clusters of mussels appearing on the wooden posts, growing at a faster rate than in their natural banks. The first site for cultivating mussels was established in 1246 and the collecting stakes were called "bouchots" or "posts”. Mussels are truly one of nature’s most delightful delicacies; they are extremely high in proteins, calcium, and iron while being low in fat and they are low in calories they contain a number of vitamins and minerals and are easily digested, not to mention they are decidedly inexpensive and good value for money. Did you know that in 2009 one of Scotland’s leading shellfish companies clinched a deal to supply thousands of kilos of Scottish mussels per week to Belgium, the world’s biggest consumer of mussels, their national dish Belgians consume around a hundred thousand tonnes of mussels each year. Delhaize came to Isle of Shuna because they are one of the few companies in the world that can supply the best quality and consistency of supply of Scottish rope grown mussels, as well as extending availability and sustainability throughout the year. 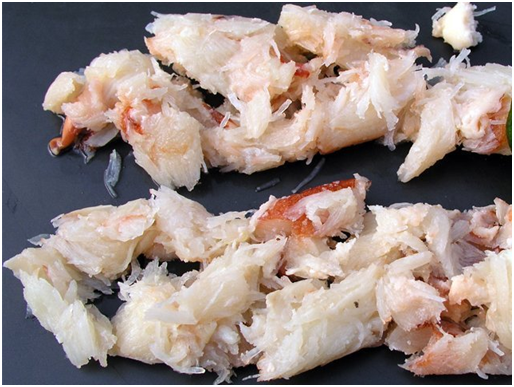 They are also excellent for your heart, containing the highest amount of omega-3 of any shellfish (this is the naturally occurring fatty acid that is believed to lower blood pressure). The protecting shells of the blue mussel are smooth, glossy, and dark blue or navy in colour, whilst the juicy meat contained within may range from a bright orange to a pale cream. The difference in colour of the meat has nothing to do with a difference in taste, although some do say that the orange meat is fleshier and tastier. The orange meat is found in the shell of a mature female mussel, whilst the pale cream meat mussels are males or immature females. Mussels can grow in the wild or as is most popular nowadays, due to a huge demand and consumption, they can also be cultured or farmed. Look for bright, clean, tightly closed unbroken shells. Fresh mussels smell briny-fresh, not ‘fishy’. When buying mussels you need to allow at least 1 pint (570 ml) per person for a first course, and 1½ to 2 pints (about 1 litre) for a main course. That may seem a lot, but some will have to be discarded and, once they have been shelled, mussels are very small and light. Don’t be tricked by how upmarket they look, mussels are the definitive uncomplicated seafood. Clean them, sauté them, steam them and hey up you’ll have a dish everyone will be wowed there are many ways to serve the mussels, but the most classic is Moules Mariniere the mussels are offered in a sauce of white wine, shallots, parsley, and butter. The ritual of cleaning and To Prepare them sounds more bother than it actually is. When you get them home, plonk the mussels straightaway into a sinkful of cold water, first of all throw out any that float to the top, then leave the cold tap running over them while you take a small knife and scrape off all the barnacles and pull off the little hairy beards. Discard any mussels that are broken, and any that are open and refuse to close tight when given a sharp tap with a knife. After you’ve cleaned each one, place it straight in another bowl of clean water. 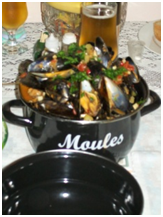 You can in addition find mussels served with sauces made with beer, or cream, or vegetable stock. For the greatest authenticity, use a shell to crack open the mussels, not your fork. Did I say that they are very good for you an 85 gram portion of cooked blue mussels contain 20 grams of protein and only 147 calories; it is rich in iron, manganese, phosphorous, selenium, zinc and vitamins C and B12. Mussels are low in fat, only containing 0.7 grams of saturated fat in an 85 gram portion. They are, though an extremely rich source of Omega-3 fatty acids, which are found in oily fish and other foods but are not produced by the body. The consumption of Omega-3 fatty acids helps prevent cardiovascular and heart disease and is an important part of a healthy diet, promoting a healthy brain as well as a healthy body. Mussels in fact contain higher levels of Omega-3 fatty acids than any other shellfish. Here below is one of our favourite recipes you can find more on our MyDish page. A quick, easy, flavoursome and attractive dish, the bacon and leeks truly enhance the mussels. I have already mentioned that we both have a weakness for mussels and that I would be including our favourite ways of serving them and once again this recipe is no exception. Wash the mussels in a colander to remove any dirt or grime. Pick through the mussels and remove the beard Discard any which does not close when tapped. Heat half the butter in a pan, and then sizzle the bacon for 3 to 4 minutes until starting to brown. Add the leeks, onion, and garlic and, then sweat everything together for 4 to 5 minutes until soft. Turn the heat up high, add the mussels’ thyme and wine, then cover and cook for 4 to 5 minutes, shaking the pan occasionally, until the mussels until the mussels begin to open. Add the cream, seasoning and parsley, stirring the ingredients with a spoon heat through making sure all the mussels are open Discard any that remain closed. Spoon the mussels and the other bits into a dish, then place the pan back on the heat and boil the juices for 1 min with the rest of the butter. Divide the mussels between two bowls if serving as a main course 4 bowls for a starter and pour the sauce left in the pan over them. Serve with crusty bread to mop up all the juices and Enjoy! Seafish the authority on seafood, BBC-Food-Mussel Recipes, Steamed Mussels with Fyne Ales Highlander Beer and Arran Mustard, Mussels with Leeks, Cider & Cream, and finally but not least is Mussels with beer. April, one of our favourite months spring has been switched on the clocks have been put forward the days are getting longer and the sun is coming out to play a little more. This is the month when the kitchen rouses itself, we ourselves liven up, and it is also the annual point in time when keeping it uncomplicated means just that, so little needs to be done with the fresh crops of English foodstuffs. It depends on what the weather is like if the commencement to this brand new season is sluggish, however you can be sure that fresh young carrots and tender spinach will be in the shops about the middle of April. Furthermore by the end of April we will have the real celebrities to look forward to; English Asparagus keep your eyes open for it in this country it only has a short 6 week season, so begin buying it as soon as you see it and don’t forget that those exquisite Jersey Royals will be making their yearly debut at the end of April. New season lamb is available from April and through the summer months, but it is at its best in June. Lamb usually comes to market between 6 and 7 months old, with a dressed weight of between 36-50 pounds. The smallest lambs (sometimes called Paulliac Lamb), are sometimes less than 4 weeks old and weigh as little as 8 pounds. 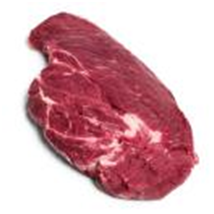 Milk-fed lamb, meat from an unweaned lamb, typically 4 to 6 weeks old and weighing 5.5 to 8 kg; this is almost unavailable in countries such as the UK and the USA, where it is considered uneconomic. The flavour and texture of milk-fed lamb when grilled (such as the tiny lamb chops known as chuletillas in Spain) or roasted (lechazo asado or cordero lechal asado) is generally thought to be finer than that of older lamb. The areas in northern Spain where this can be found include Asturias, Cantabria, Castile and León, and La Rioja. Milk-fed lambs (and kids) are especially prized for Easter in Greece, when they are roasted on a spit. Salt marsh lamb the meat of sheep which graze on salt marsh in coastal estuaries that are washed by the tides and support a range of salt-tolerant grasses and herbs such as samphire, sparta grass, sorrel and sea lavender. Depending on where in the world the salt marsh is located, the nature of the plants may be subtly different. Salt marsh lamb has long been appreciated in France and is growing in popularity in the United Kingdom. Places where salt marsh lamb are reared in the United Kingdom include Harlech and the Gower Peninsula in Wales, the Somerset Levels and the Fylde coast and Morecambe Bay. While lamb doesn’t often feature in oriental cookery, however, it’s mouth-watering with soy sauce, ginger, or honey. As we said new season lamb is now available and is absolutely fantastic but it will be at its very best in June, Beef, Pork, Chicken, and Wood Pigeon are still all very good. Fishing has been improving with the better weather conditions, although the tides have been very big, which affects the practicality of netted catches especially obvious in smaller ports like Looe. Lobster prices have been mulishly high this year for our own British caught lobsters, as ever, you can get cheaper from elsewhere, although they will be of the Canadian or American type and apart from being in general awfully small, they will have travelled countless miles to reach your plate. The West Country boats are starting to land more and you can expect prices to start to come down, having said all that, Cornish Lobster is scrumptious and worth paying that bit more for as an indulgence. Plenty of Bass and Pollack are being landed, but the Plaice are also terrific at this time of year and the first landings of Wild Black Bream have started, while regular landings are a couple of weeks off it looks like we are going to have plenty to go around. 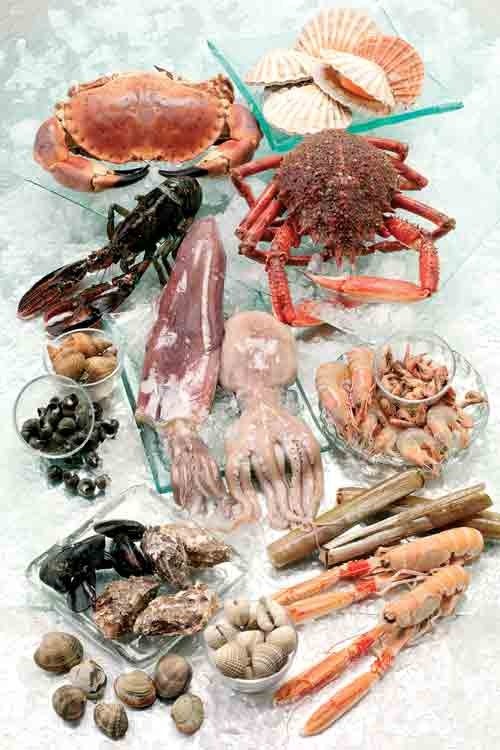 All the usual suspects, Brown Crab, Cockles, Conger Eel, Crab, John Dory, Lobster, Razor Clams, Salmon, Sea Bass, Sea Trout, Shrimp, Whitebait, Winkles, and Wild Salmon are very good, so please support your local fishmonger and eat fish. Pig farmers are demanding a fair price for British Pork and are urging national retailers to sign up to a voluntary labelling initiative. With rising cereal prices and increased fuel costs, farmers are losing money on every pig produced. So far Morrison’s has been praised for their commitment to the supply chain but the industry is urging Tesco and Asda to follow suit in selling British produce rather than relying on cheap imports, which are often produced under far less stringent animal welfare conditions. Asda has pledged to work with its suppliers to ensure none of its products will contain egg from battery cages as of next year. All eggs in shell sold by Asda are British, making it relatively easy to verify which rearing systems they come from, but products using liquid egg can be trickier, given EU cross-border trade. Sainsbury’s has also pledged that all suppliers will be legally required to use non-battery eggs by 2012. KFC is set to become the first fast-food chain to be certified by the Red Tractor assurance scheme. KFC already source their chicken-on-the-bone products from Red Tractor certified British suppliers, but the company itself has until now not been certified. The Cornish Pastie has been give ‘protected geographical indication’ status by the European Commission; joining the 42 other British protected products such as Melton Mowbray pork pies and Arbroath Smokies. Sainsbury’s has teamed up with Ladies in Beef to help promote the new ‘Great British Beef Week’ which runs from 29-30 April. The retailer will offer on-pack promotions during this time. 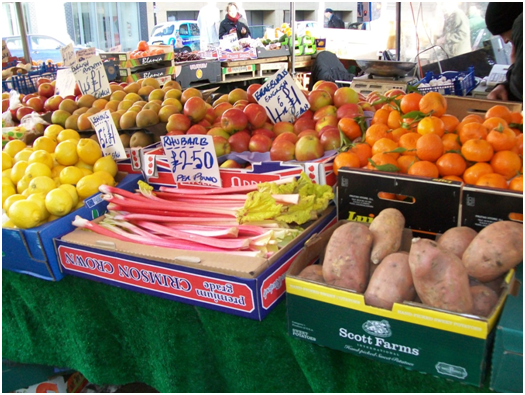 When buying British make sure you read the small print as almost a fifth of foods labelled as ‘local’ on sale are making the claim falsely, a study by The Local Government Regulation has revealed. Examples include ‘Welsh lamb’ from New Zealand, ‘Somerset butter’ from Scotland, and ‘Devon ham’ from Denmark. Restaurants have the highest incidence of false claims with 19 per cent, while manufacturers had the fewest with 11 per cent. Asda and Defra are working with key players in the UK dairy industry to create a new milk roadmap. Dairy 2020 will build on the work of the Dairy Supply Chain Forum’s Milk Roadmap – the industry’s environmental sustainability strategy – but will also include social and economic sustainability. Finally, according to a Tesco survey French food is still the fastest growing cuisine in the UK, with a recent 27 per cent increase in French ready meal sales. Chinese cuisine is close behind in second place with British cuisine in third. So come on everyone, buy British! Well there were Apples English Braeburns and Bramleys, Artichokes, Beets, English Broccoli, Cabbage, Cauliflower, Courgettes, English King Edward Potatoes, Fennel, Field Mushrooms, Leeks, Mache (Lambs Lettuce), Parsnips, Purple Sprouting Broccoli, Radish, Watercress, you can plainly see that all of what was available was in first-rate condition. The lamb is some of the best we have seen and his beef is well hung, Scottish and the steaks we had were absolutely great, the pork is outdoor reared and has a great taste with the fat to meat ratio spot on. The corn-fed chickens looked plump with a nice colour to them; this butcher is very proud of his offerings and has every right to be so. 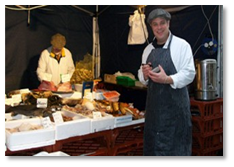 Our Local Fishmonger Jon Norris on Tachbrook Street Market. 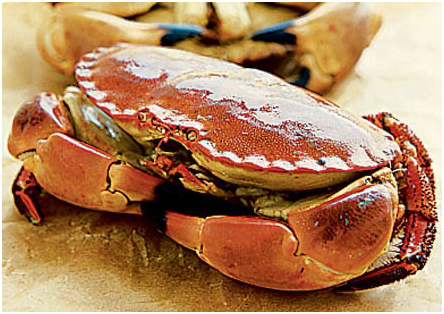 Push the boat out with the respected English custom of potting seafood, combine the tender, sweet flesh of crab with sherry, herbs and lemon juice, its same idea as potted shrimp, but used for delectable crab meat using the most superb white claw meat and creamy brown meat, mixing with spices then topping it with the finest English, Welsh or Cornish butter. Now mix in the crab meat, anchovy essence, lemon juice, salt, and pepper spoon this mixture into ramekins, cover the surface with melted butter to seal off the air and cover with cling film, and chill for 2 hours. What a magnificent dish, more or less identical to the one Maureen and I used to have at the Bakery Restaurant on the Greek island of Spetses (This restaurant is on the top floor above one of the island’s more popular patisseries). We tried it at Wilton Lodge for a dinner party, which was a triumph, so much, so that in the winter/spring of 1992 at Norwood West, Palm Springs it was a great favourite. Put the leg of lamb into a large roasting pan. Bruise the leaves of the sprigs of rosemary, thyme, and oregano and sprinkle them over the meat, add plenty of pepper and 1 tablespoon of honey. Rub the mixture into the meat with your hands then rub half a lemon over the joint, squeezing the juice on to the meat as you do so. Do not add any salt. Leave to marinate for 4 to 24 hours. Peel and quarter the potatoes, then arrange them in a single layer round the lamb. Squeeze lemon juice over the potatoes, use at least half a lemon, or up to one and a half lemons for a strong lemony flavour. Carefully pour ¼ pint of water into a corner of the roasting pan, then sprinkle over the potatoes and lamb about 2 tablespoons chopped fresh rosemary, at least 1 teaspoon each fresh chopped thyme and oregano, and some salt and pepper. Drizzle on 1 to 1 ½ teaspoons of honey and 1 tablespoon of olive oil, then dot with 1 oz of butter. The ingredients will become golden and will caramelize to a rich brown in places. Lift the meat and turn the potatoes occasionally, and if necessary, add a little boiling water to the pan to prevent drying out. Add the cream, seasoning and parsley, stirring the ingredients with a spoon heat through making sure all the mussels is open Discard any that remains closed. A colleague asked what ever happened to potted salmon, potted shrimp, and potted beef? Well that is certainly a tough question to answer and one that we had been talking about quite recently, when we found that we could only obtain Morecambe bay potted shrimps online, Maureen loves Morecambe Bay potted shrimp especially from Baxters and I adore potted crab and potted ham and yes my friend you are right potted meats are very hard to find. “The great British skill of potting meat and fish seems to have been for the most part forgotten by most of today’s chefs. Well made potted foods are national dishes of which we should be justly proud.” (Michael Smith, Fine English Cookery). Maureen and I have been making, serving and eating potted meats and fish for most of our working lives, potted beef, potted shrimps, potted salmon and potted game are national treasures and the meat and fish pastes we see in the shops and supermarkets no matter how bland are all based on the cooking technique we call potting and it is such a disgrace that this form of cooking is/has been forgotten by our leading chefs. There was a minute, about 15 years ago, when potted meats and fish should/could have made a comeback, contemporary British cooking had rejected the so-called “Nouvelle Cuisine” both chefs and their customers were responding quite angrily in opposition to daft combinations associated with miniscule portions and astronomical prices. Rustic, homemade, home cooked and other descriptions started being used and it was thought that a return to good British culinary practices was making a return, what happened? Nothing and we blame the experimental chefs with their scientific attitude, in some ways it was fusion cuisine, we could blame Jamie and his continental influence, it was sous-vide (to me that was just a way to get “Boil-in-the-Bag” a respectable image), water baths and other new equipment, the modern chef and the celebrity chef/cook was too busy trying to find new producers or crafting new dishes that took 20 minutes or less to prepare to look back in time to a period of good honest simple cooking. If they had looked back to that period of time when chef’s like Albert and Michel Roux were setting up La Gavroche, when John Tovey of Miller Howe was being his brilliant self, or even further back to Elizabeth David and Isabella Mary Beeton they would have found vanished parts of our very own repertoire such as: Pâtés, Terrines, Mousses, Rillettes and of course Potting meat, which when you think about it is the cooking cousin of Rillettes. Just have a browse through old recipe books and you’ll find ways of potting every kind of meat and fish, from kippers, salmon, and shellfish to beef, pork, ham, and chicken, and from rabbit to venison. Potted meats and fish are likely to be more or less rich, both from rendered fat or butter; than Rillettes, also they have more diverse seasonings than would be used in France, Spain, and Italy. Mace is the most usual spice used, although cayenne, ginger, nutmeg and black or white pepper is commonly used as well. Potted foods were meant to be used as stored foods pretty much like the meat pastes of today and when I was learning my craft they were frequently made from leftovers you can make potted meat from any leftover roast. Just chop the meat and mix with melted butter, cayenne, lemon zest, salt, pepper, and mace with a little nutmeg, set into a dish with a few herbs or a bay leaf on top, this is my take on Rillettes, an uplifting meal they should keep for about 2 weeks in the fridge although why keep them in the fridge just eat them with some toast, homemade relish and some salad. So I say bring back our potted meats, fish and seafood, bring back our terrines, mousses and pastes they make a great starters, snacks and sandwich fillers and what’s more they are kind to your pocket and it is beginning to happen! Michel Roux serves a beautiful Classic duck foie gras terrine at La Gavroche, Mike Robinson owner of the highly acclaimed Pot Kiln Pub and Restaurant in Yattendon, Berkshire makes a delightful potted venison and other brave chefs and establishments such as “The Walrus and The Carpenter” 45 Monument Street, London serve a tasty potted beef at under a fiver. Hugh Fearnley-Whittingstall is a great advocate of potting and making terrines and even Jamie has got back on track with a recipe for “Old-fashioned potted crab” although I can’t see a lot of differences between that recipe and a traditional recipe that we use, having said that it is wonderful to see that other chefs across the land are now serving potted meat, fish and shellfish in their restaurants, pubs and bistros. 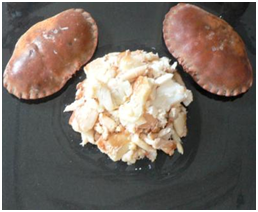 Below and on MyDish you will find recipes from myself and others for potted meat, fish and shellfish recipes and served with crusty bread, toast, and some salads and chutneys you will be able to serve up to friends and families a amazingly flavoursome meal. Potted Beef and Potted Crab below are recipes from Jo Pratt and myself. These little pots of juicy prawns and sweet crabmeat in a delicate, dill-flavoured butter are perfect for a beach picnic. Spread over some rye or crusty bread for a light, tasty nibble, so says Jo Pratt from the Mail online and we have just got to agree with her and you do not need to change any of this recipe it is as tasty as it is scrumptious! Gently melt the butter in a saucepan and pour into a jug for all the milky solids to sink to the bottom. Mix together the prawns, crab, dill and lemon zest and season with salt and a shake of cayenne pepper. Divide between a couple of small pots or ramekins and pack down really well with the back of a spoon. Pour over the clear (clarified) butter to just cover the mixture, leaving behind the milky solids. Chill in the fridge for about 45 minutes to set the butter. Cover each pot with cling-film and pack in a cool bag with your chosen bread. Don’t forget some napkins and a couple of knives to scoop out, spread the potted prawns, and crab on to the bread Serve and Enjoy! Jo Pratt is a regular face on Market Kitchen cooking delicious no-fuss recipes. Jo graduated in July 1995 from Liverpool John Moores University with a BA honours degree in Home Economics. She went on to work with Gary Rhodes at the BBC Good Food Show in November 1996, before becoming the main home economist for all his series and books. Jo has worked with many other celebrity chefs including Ainsley Harriot, Anthony Worrall Thompson, Jamie Oliver, Tony Tobin, and Brian Turner on various television, demonstrations, and photography projects. Readers of Elle magazine will be familiar with her monthly food column, Elle’s Kitchen. She co-wrote The Nation’s Favourite Food in 2003, and provided the recipes for dishes voted for by the British public to accompany the eponymous titled TV series. 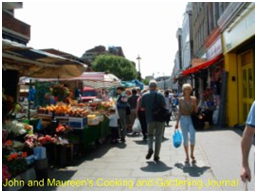 This year, Jo published her new book In the Mood for Food. Sweet succulent brown shrimp enveloped in a seasoned butter encapsulating a revered stylishness that is simply wonderful for a summery starter or light lunch. Coming from Lancashire we have always had Morecambe bay potted shrimps, and when we were at the Willow Tree restaurant at Bolton-le-Sands just outside Morecambe we always used to serve Baxters of Morecambe potted shrimps. After a couple of years and we were moving down to the Great Tree Hotel, Chagford, Devon this was about 1979, I cheekily asked for their recipe, they refused of course but with a little persistence I was able to obtain this recipe not the original but close enough and it quickly became very popular with the patrons at the Great Tree Hotel. At Baxters they have been producing Morecambe bay potted shrimps since 1799 and are extremely proud to be the oldest and most traditional such company in the country let alone Morecambe. They pride themselves on quality and their potted shrimps have achieved the highest accolade with the granting of royal warrant in the 1970’s which they retain to this day based on a totally unique recipe which has been handed down through the family for seven generations. In a saucepan melt the butter then add the ground black pepper, mace, cayenne pepper, and bay leaf allow the butter to cool until it is just warm, remove the bay leaf. Place the shrimp equally into 6 ramekins cover with the spiced butter and a little salt place into the fridge and chill until set. Toast the bread and serve warm with the potted shrimp and a wedge of lemon and enjoy! Potted shrimps, old fashioned and buttery are eternally associated with Morecambe bay in Lancashire, where shrimps are potted to this day. The main season for them is from August bank holiday (the last Monday in August) to Christmas and it is the peeling that makes potting shrimps so labour intensive thus expensive. Morecambe bay brown shrimps are celebrated for their delicate taste and unique texture; they have been caught by local fishermen for hundreds of years. Even though the fishing methods have changed, with the horse and cart being replaced by the tractor, locals still follow the same traditional recipes that have been passed down in their families. Locally caught shrimps, boiled in butter with a secret combination of spices until they are tender they are then sealed with butter and packed into pots, they can be eaten either warm or cold.